Solar View has provided the Sheerweave Shade for an array of decors and venues. The product by nature does not confront but compliments any décor. The beauty of Sheerweave is the design. 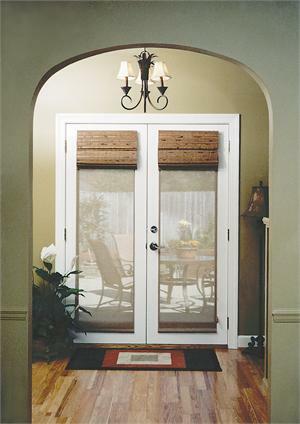 It enables a view out of the window, producing an ambience of openness coupled with effective sun and glare protection. The principal advantage of the Sheerweave Shades is the diversity; down when you need them…up when you don’t. … or enjoy the sheer splendor and leave them in place the entire day. If you are bothered with winter’s penetrating cold, Sheerweave creates a barrier between the inside warmth and the extreme cold of the glass surface. The Sheerweave 4000 styles offer a 5% openness weave, meaning that it blocks 95% of the UV rays. It is made of 25% Polyester and 75% Vinyl on Polyester for durability. Select Width 24" 25" 26" 27" 28" 29" 30" 31" 32" 33" 34" 35" 36" 37" 38" 39" 40" 41" 42" 43" 44" 45" 46" 47" 48" 49" 50" 51" 52" 53" 54" 55" 56" 57" 58" 59" 60" 61" 62" 63" 64" 65" 66" 67" 68" 69" 70" 71" 72" 73" 74" 75" 76" 77" 78" 79" 80" 81" 82" 83" 84" 85" 86" 87" 88" 89" 90" 91" 92" 93" 94" 95" 96" 97" 98" 99" 100" 101" 102" 103" 104" 105" 106" 107" 108" 109" 110" 111" 112" 113" 114" 115" 116" 117" 118" 119" 120"
Select Height 30" 31" 32" 33" 34" 35" 36" 37" 38" 39" 40" 41" 42" 43" 44" 45" 46" 47" 48" 49" 50" 51" 52" 53" 54" 55" 56" 57" 58" 59" 60" 61" 62" 63" 64" 65" 66" 67" 68" 69" 70" 71" 72" 73" 74" 75" 76" 77" 78" 79" 80" 81" 82" 83" 84" 85" 86" 87" 88" 89" 90" 91" 92" 93" 94" 95" 96" 97" 98" 99" 100" 101" 102" 103" 104" 105" 106" 107" 108" 109" 110" 111" 112" 113" 114" 115" 116" 117" 118" 119" 120"
Please call for a quote for widths over 96" at 1-800-595-8072.